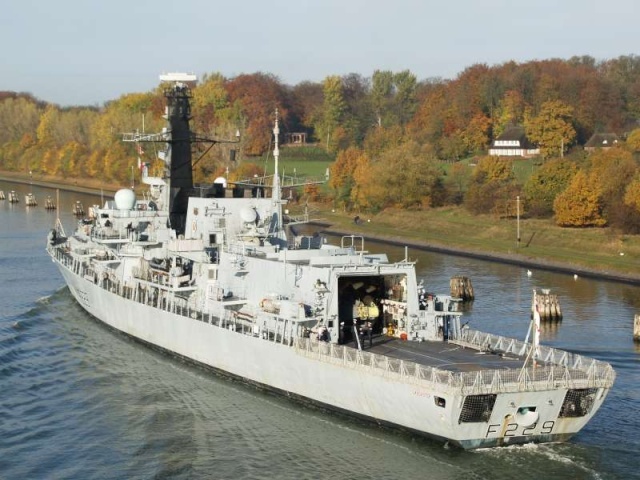 HMS Lancaster (F 229) in kiel canal, 30-10-2007. HMS Lancaster (F 229) entering Portsmouth Harbour on the 1st November 2007. Royal Navy anti-submarine frigate HMS Richmond has foiled an attempt to smuggle human cargo into Yemen dealing a huge blow to a trafficking gang in the process. 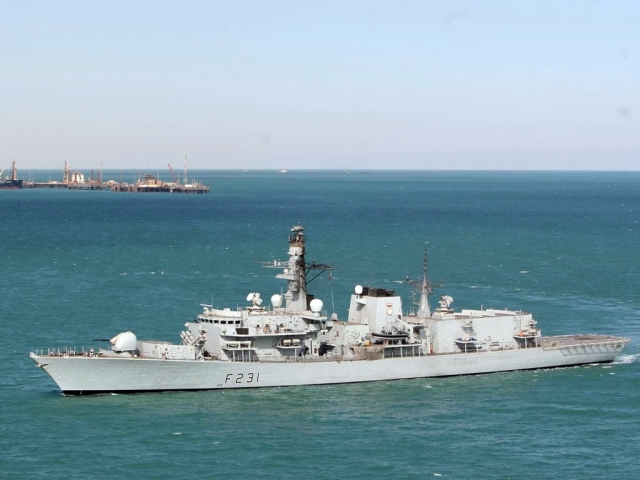 number of suspected human smugglers were arrested and their boats seized in a joint operation involving Royal Navy warship HMS Richmond and the Yemeni Coastguard. 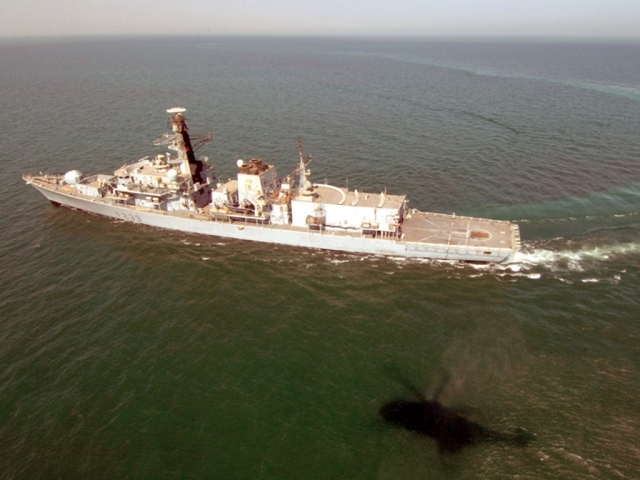 Having covertly tracked two suspicious dhows throughout the day, under the cover of darkness, HMS Richmond followed the two smuggling boats as they headed back to Somalia and co-ordinated a close-quarters intercept. "Monitoring the suspected smuggling vessels from afar using the ship's tracking capabilities we could clearly see some suspicious activity underway. Using the 'stealthy' features of the Type 23 Frigate, 13 suspected human smugglers were arrested and two vessels seized. The message this sends to others involved in this illegal activity is quite clear." 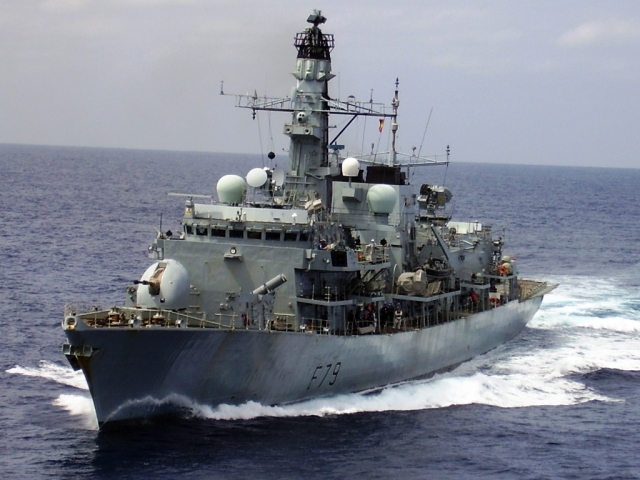 The UK Royal Navy, US and German navies are working with the Yemeni Government to promote lawful use of the maritime environment in the Gulf of Aden and the wider region to reduce the activities of human smugglers and pirates. According to the United Nations High Commission for Refugees (UNHCR) (2007) figures nearly 25,000 refugees have made the journey from war-torn Somalia to Yemen and there have been more than 1,000 recorded deaths. HMS Richmond will remain in the Red Sea until the end of November conducting Counter-Piracy and Maritime Security Operations (which includes deterring illegal activities such as human smuggling) and is due to return to the UK shortly before Christmas. She recently arrived in the area after conducting a successful period in the Northern Arabian Gulf protecting the Iraqi oil platforms from potential terrorist attack. 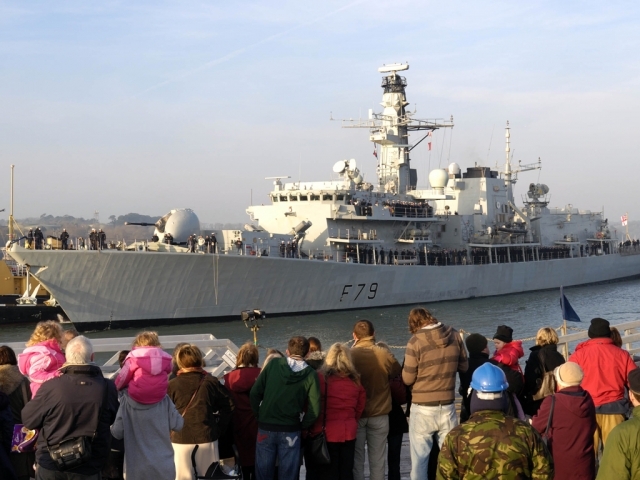 Portland is the location for a high profile twist on the Royal Navy’s sea training this weekend (7-9 December 2007). Four thousand tonne Type-23 frigate HMS Somerset is completing her sea and harbour safety training while also being placed under the scrutiny of the media – an essential modern skill for Royal Navy ship visits to ports at home and abroad. 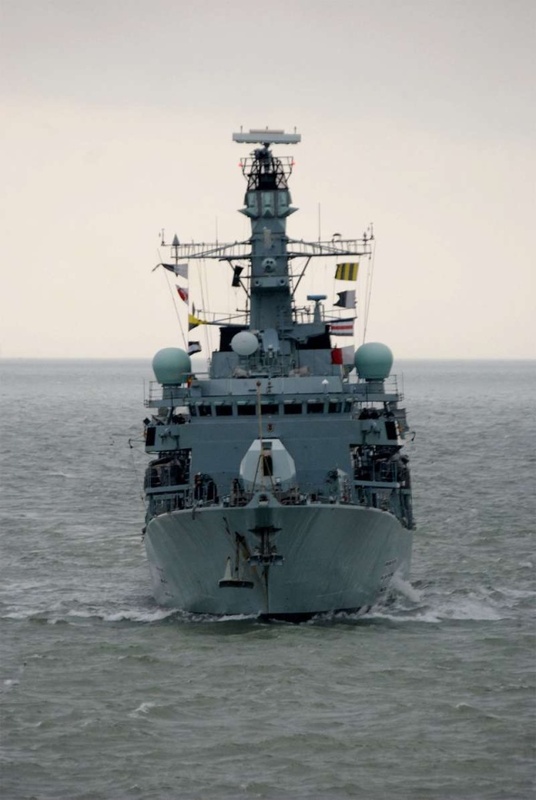 Under the watchful eye of the Navy’s Flag Officer Sea Training (FOST) staff, every aspect of Somerset’s procedures and behaviour will be scrutinised over Saturday and Sunday. This will include the ship and her crew being assessed on how successfully they keep a positive Royal Navy profile in the public eye throughout the visit, hampered by numerous scenarios that will be injected by FOST staff. The ship will be judged on her performance handling a real life series of public events, including entertaining local civic dignitaries; hosting an evening presentation; and allowing the general public to come on board on Sunday. In addition, as HMS Somerset enjoys close links with her affiliated county of Somerset, guests at an afternoon lunch hosted by the Commanding Officer will include the High Sheriff of Somerset, Mr David Ledlock, and the Lord Lieutenant of Somerset, Lady Elizabeth Gass. Members of Ship’s Company will also be taking part in a special service in St Andrew’s Church to commemorate the 75th anniversary of the sinking of the aircraft carrying submarine M2 in Portland. HMS Somerset’s Commanding Officer, Commander Rob Wilson, said: “This visit to Portland is an essential element of our meticulous preparations for heading to the Mediterranean early next year, and comes on the back of an intensive two months of operational training in the south west exercise areas. “The training is designed to test the Ship’s Company to its limits, both physically and mentally, and prepare us to successfully respond to any situation, whether it be boarding a merchant ship in support of United Nations sanctions or carrying out the evacuation of non-combatant UK citizens from trouble spots. HMS Somerset has recently undergone a multi-million pound refit in Rosyth, Scotland, to fit her with the latest in weapons and sensors technology. On successful completion of operational sea training, she will deploy on operations early in the New Year. Powerful and versatile, with the capability to operate anywhere in the world, the Type 23 Frigate is the mainstay of the modern surface fleet. 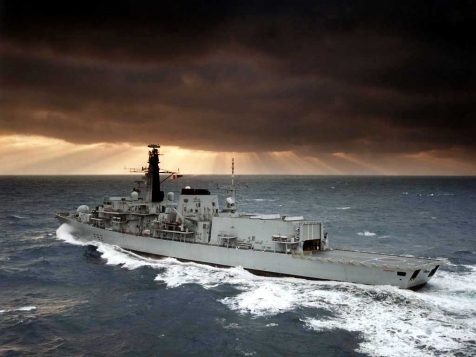 The 13 Type 23 frigates form 50% of the total Frigate/Destroyer force in the Royal Navy. Originally designed for the principal task of anti-submarine warfare, they have evolved into multi-purpose ships with the capability to operate anywhere in the world. The effectiveness of these ships is enhanced by their stealth design, which reduces their radar signature significantly. In addition to the war-fighting roles described above, the ship is trained to conduct a wide range of other tasks. These include embargo operations using boarding teams inserted from the ship's boats or helicopter, disaster relief work and surveillance operations. 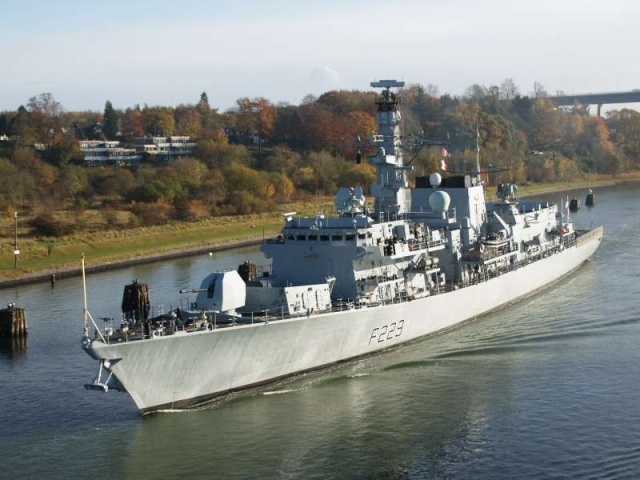 Whilst she is in Portland, HMS Somerset will also be open to visitors on Sunday, 9 December from 10.30am to 1.30pm. This is a chance for visitors to learn more about life on the ocean waves and what it is like to live and work onboard a warship. Admission is free. 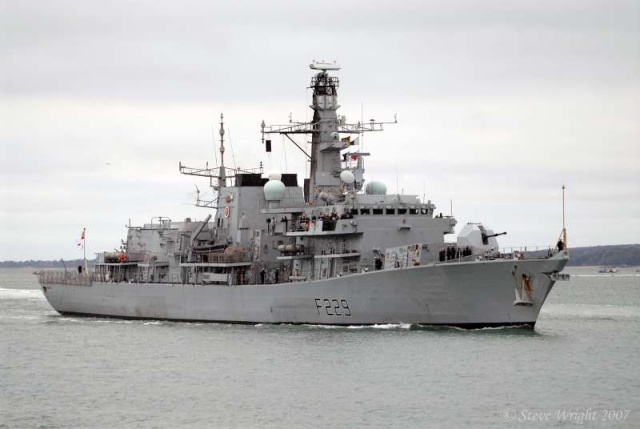 Defence Minister Baroness Taylor today announced a £35 million major upgrade to the Royal Navy frigate HMS Sutherland. 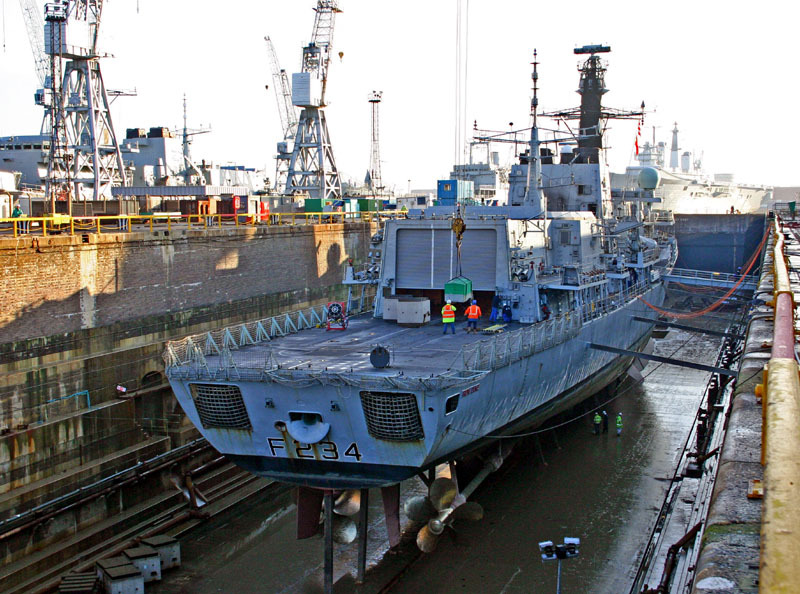 New equipment valued at £18 million will be installed as part of a general overhaul of the ship under a £17 million contract with Babock Marine at their Rosyth dockyard in Scotland. • the Navy’s latest and most sophisticated submarine hunting sonar system, capable of identifying submarines at an even greater range. • an advanced Seawolf air defence missile system, which will counter the advanced threat from missiles and fixed wing aircraft. • a new improved main gun, capable of firing long-range ammunition. • a reshaped stern to cut fuel use. As Argyll continues her patrol of the oil platforms as part of a multi-national coalition, opportunities arise for members of the ships company to meet and greet other sailors from around the globe. Teams consisting of 2 chefs were given a surprise bag of ingredients to conjure up what they could in 2 hours. You could have cut the pressure cooker atmosphere with a carving knife as both teams sweated it out in the galley. Leading Logistician (Catering services) Jamie Gardener and Logistician (Catering Services) Mark Young combined their gastronomic expertise to concoct a few palate-pleasing recipes. Independent adjudicators, Lt Lindsey Ashwood, a Royal Navy Press Liaison Officer, and Mr Tristan Nichols, a journalist from the Plymouth Herald were amazed at the quality of food produced by both teams, and after much deliberation, cogitation and digestion, pronounced Argyll’s team worthy winners. Cdr Pritchard, the Commanding Officer of Argyll was proud to present the trophy to team captain, Leading Logistician (Catering Services) Jamie Gardener. The event, organised by the Logistics Officer, Lt Cdr Steve Forge, was a great success, and displayed the tremendous range of skills of the chefs, producing food of the highest quality with no planning, and on completion making equally delicious food for 200 hungry sailors. Portsmouth-based warship HMS Richmond returns home on Wednesday (Dec 19) from an eventful seven-month security mission in the Arabian Gulf. 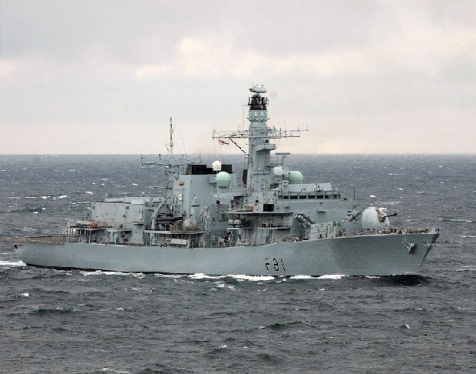 The Type 23 frigate patrolled the northern Gulf as part of the UK’s contribution to security and stability in the region. Richmond helped protect Iraqi offshore oil rigs and oil terminals - vital to that country’s economic development – and policed busy shipping lanes to protect and boost confidence in maritime trading and help to counter smuggling and piracy. Her boarding team comprising RN and Royal Marines personnel carried out patrols and boarding operations to foster relations with merchant mariners and local fishermen. Training was given to Iraqi Marines and Naval staff in boarding and command and control operations, allowing them to carry out security duties in the future. In September Oman was struck by Cyclone Gonu and Richmond was able to help the disaster relief effort by providing 7,000 bottles of drinking water. After handing the reins to her sister ship HMS Argyll last month she paid a formal visit to Ras Al Khaimah when they hosted Sheikh Saud Bin Saqr Al Qasimi – the first visit to the Emirate by a Royal Navy warship in two years. But Richmond’s busy deployment was not over. She worked closely with the Yemeni Coastguard to arrest 13 suspected people smugglers, covertly tracking two suspicious dhows as they headed towards Somalia and coordinating their interception and seizure. Richmond covered 25,000 nautical miles during the deployment and her Merlin helicopter flew 104 sorties in the Gulf, spending a total of 250 hours in the air. The ship’s galley prepared 155,600 meals and cooked 35,680 sausages, 2,024 kg of bacon and 13,600kg of potatoes. Work to install the first fit of a new, upgraded NATO Radial Chemical, Biological, Radioactive, Nuclear (CBRN) filter system to the Royal Navy Type 23 frigate HMS Iron Duke has been completed as part of the ship's ten-month maintenance period in Portsmouth. The system, potentially the forerunner to all ships in the Class being fitted with similar units, takes into account the latest developments in CBRN technology and will enable more cost effective through-life support through less frequent requirement for filter changes. Fleet Support Limited (FSL) has worked closely with the Marine Environment Survivability and Habitability and Frigates Integrated Project Teams to provide installation design, installation, testing and trialling of the new system, which included new installations to the ship's superstructure as well as a considerable revamp to existing in-board fittings. The CBRN upgrade was one of the major elements of the project on HMS Iron Duke, which saw a 40 per cent growth in workload during the life of the programme. Externally, the frigate was fitted with a new transom flap to improve fuel economy, a considerable number of sea tubes were replaced, radar trackers removed and overhauled, and finally an extensive painting package was completed. Work internally was equally demanding with a varied menu of activity on the ship's machinery, particularly the gearbox. A new aircraft handling system enabling the ship to take the Merlin helicopter was fitted, while crew are benefiting from considerably enhanced accommodation. With a new crew, the ship will embark on an intensive training period early next year following successful completion of her sea trials. "Although we took into account the development of emerging work it turned out to be around twice what was anticipated. It required close and flexible working with the Frigate IPT and ship's staff to successfully carry out the additional tasks." "The efforts put in to achieve what became a significant package of work by all the members of Team Portsmouth was impressive," he explained. "I am immensely proud of the way in which my Ship's Company responded to the challenge. Iron Duke is now a much more capable warship and being able to embark a Merlin helicopter gives me a huge increase in capability." "The finish in the mess is really good, all the lads are really pleased and so am I." The crew of HMS Westminster took part in an ancient tradition at the weekend when they marched through the Tower of London delivering a barrel of rum to its Constable. 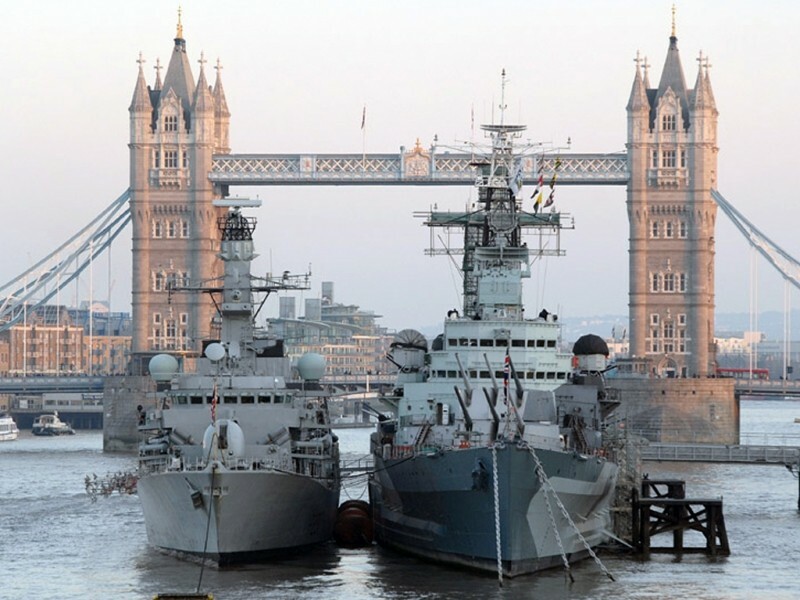 The Type 23 frigate HMS Westminster sailed up the Thames and under Tower Bridge, which was lifted to allow her to pass, before she moored at Tower Wharf, outside the almost 1,000 year old London castle. Ancient rights dictated that every ship that came upstream to the City of London had to unload a portion of its cargo for the Constable, thus enjoying the protection of the Tower of London guns. Today, the tradition of the Ceremony of the Constable's Dues is kept alive when every year the captain of a Royal Navy ship entering the Pool of London delivers a barrel of rum to the Constable. The captain and his crew are firstly challenged for entry to the Tower by the Yeoman Gaoler, the second-in-command of the Body of Yeoman Warders (or Beefeaters). The captain and his naval ratings then march through the Tower of London, accompanied by Yeoman Warders in State Dress and a Corps of Drums, to Tower Green, where the Constable is presented with the barrel of rum. Afterwards, all retire to Queen's House on Tower Green, the oldest surviving timber building in the City, to sample the contents. 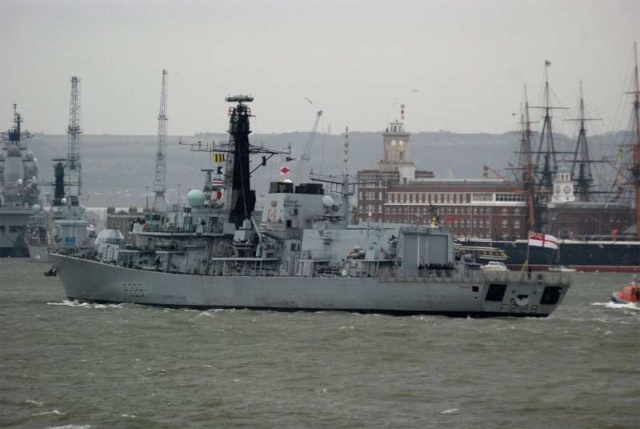 HMS Westminster was launched on 4 February 1992 and commissioned into service in 1994. One of her more unusual claims to fame was when she was used for the interior shots in the James Bond film 'Tomorrow Never Dies'. She enjoys excellent relations with the City of Westminster, the Household Cavalry Mounted Regiment, the Worshipful Company of Fanmakers and London Underground (Westminster Station of course!). The 13 Type 23 frigates of the Royal Navy are the mainstay of the modern surface fleet forming 50 per cent of the total frigate/destroyer force. Originally designed for the principal task of anti-submarine warfare, they have evolved into multi-purpose ships with the capability to operate anywhere in the world, conducting operations that include embargo enforcement and maritime security operations using boarding teams from the ship's boats or helicopter, disaster relief work and surveillance operations. Following a six and a half month deployment to the Far East in 2006, this year has seen HMS Westminster focus on training and essential maintenance, rejuvenating herself ready to deploy for another six months in January 2008. She has just concluded Exercise Neptune Warrior - a rigorous training exercise off the west coast of Scotland, which saw the Royal Navy and units from other Naval Allies divide into two opposing sides and exercise real time tactics and warfare against each other. The Ceremony of the Constable's Dues came about after the City of London became angered at paying tolls to the Kings of Britain during the Middle Ages. Successive Kings believed it was their right to extract tolls from vessels on the Thames. On the King's behalf the Constable of the Tower of London was empowered to demand these tolls as a perquisite of his office. In 1381, King Richard II issued a grant that set out in detail what he believed to be a fair list of tolls, one of which required that every galley passing the Tower should present 'two roundlets of wyne' to the Constable. Such tolls continued to the 17th Century when the volume of traffic on the Thames had increased to such an extent that it was no longer feasible. It is in recent years that the tradition has been revived. The crew of Plymouth-based Royal Navy warship HMS Northumberland sail into the port on Friday (21 December) to an expected warm welcome from friends and family after a busy four months deployed in the Mediterranean and Red Sea. The ship was deployed with a standing NATO maritime task group along with navies from Turkey, Italy, Spain, Greece, Germany and US. They were engaged on NATO's Operation Active Endeavour patrolling the waters of the Mediterranean to prevent acts of piracy, smuggling and other illegal activity. Under the Flag Officer Sea Training organisation, prior to deploying later in 2008. The ship’s task group was under the higher command of Admiral Sinan Ertugrul of the Turkish Navy and the deployment proved extremely busy, yet highly rewarding with all navies making a significant contribution to maritime security. Mid-way through her deployment HMS Northumberland took part in exercise Noble Midas (within Operation Active Endeavour) involving over 40 ships and 19,000 personnel from 12 NATO countries. Under French auspices and hosted and centred around Croatia, the exercise was based on the scenario of a NATO force reacting to an attempted coup by a renegade country. The exercise effectively qualified the task group as part of NATO’s umbrella rapid reaction force. HMS Northumberland, an anti-submarine warship, then conducted maritime security operations in the Red Sea and Gulf of Aden. This was the first time the task group had operated in this key area in this role. Despite the high operational pace, port visits were taken to both raise awareness of and reinforce the UK and NATO’s engagement on a regional basis and to allow all the navies’ crews some rest. 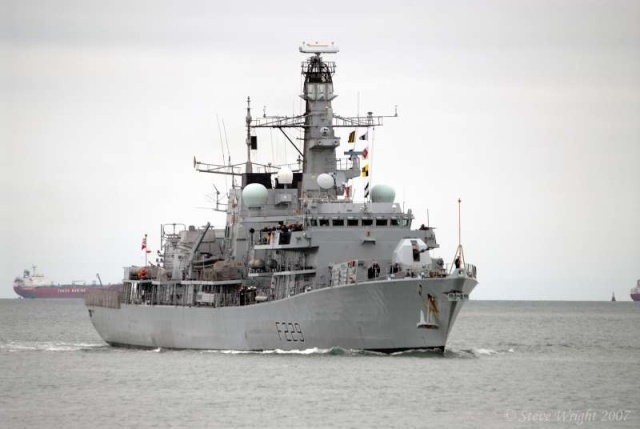 Plymouth based Royal Navy warship, HMS Portland, is returning home following a six and a half month deployment to the Caribbean and North Atlantic. Since the Type 23 frigate has been deployed, the ship’s company have participated in a multi-national exercise off the east coast of America, assisted in Belize with the aftermath of Hurricane Dean and prevented seven tonnes of cocaine from reaching its destination. In doing this the ship has travelled a total of 34908 nautical miles, spending over 3000 hours underway. In Belize in August, 40 members of the ship’s company went ashore by helicopter to assist in the disaster relief effort following the impact of Hurricane Dean, a category five hurricane. They replaced roofs on over 100 houses, cleared roads, repaired electrical supplies and the team included HMS Portland’s doctor, who was able to conduct a clinic for the locals. In late October, HMS Portland was conducting a routine anti-narcotics patrol when she discovered a suspicious looking fishing vessel. As the vessel was approached she increased in speed and the crew were seen throwing packages over the side. Once it was clear she could not escape, the vessel stopped and a total of 3.5 tonnes of cocaine was discovered onboard. Together with previous disruptions, this made a total of seven tonnes of cocaine that HMS Portland prevented from reaching its intended market. Almost 400 people are due to watch the ship sail back into Devonport, and to welcome their loved ones home in time for Christmas. Amongst them some new arrivals, including Mackenzie Thompson and Millie Sexon who were both born while the ship was deployed. Plymouth-based Royal Navy warship HMS Portland extra special today. More than 400 families and friends, serenaded by a Royal Marine Band, crowded onto the jetty at HM Naval Base Plymouth in the freezing wind as the warship came in after six months deployed fighting drug smugglers and helping hurricane-hit islanders. Privileged to be second down the gangway onto the jetty (after the Captain Commander Mike Utley) ahead of his shipmates was Chef Philip Thompson, 24, who knelt down on the ground and proposed to his partner Miranda Woodhouse, 25, who gave birth to their first child while he was away. The deployment to the Caribbean and North Atlantic included a multi-national exercise off the east coast of America, assisting in Belize with the aftermath of Hurricane Dean and preventing seven tonnes of cocaine from reaching its destination. The ship travelled 34,908 nautical miles. 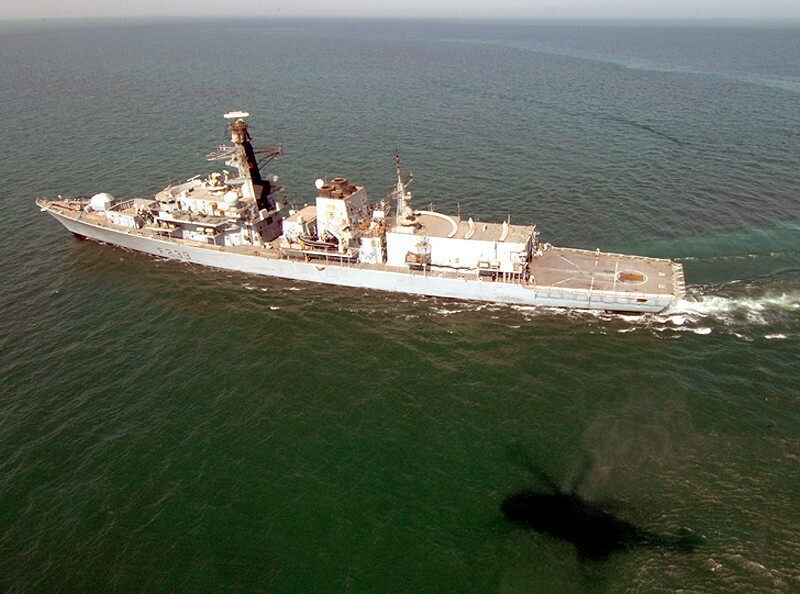 Shortly after sailing in early June 2007, HMS Portland joined ships from the French, Russian and United States navies in a major exercise. In Belize in August, 40 members of the ship’s company went ashore by helicopter to assist in the disaster relief effort following the impact of Hurricane Dean. They replaced roofs on over 100 houses, cleared roads, repaired electrical supplies and the team included HMS Portland’s doctor, who was able to conduct a clinic for the locals. 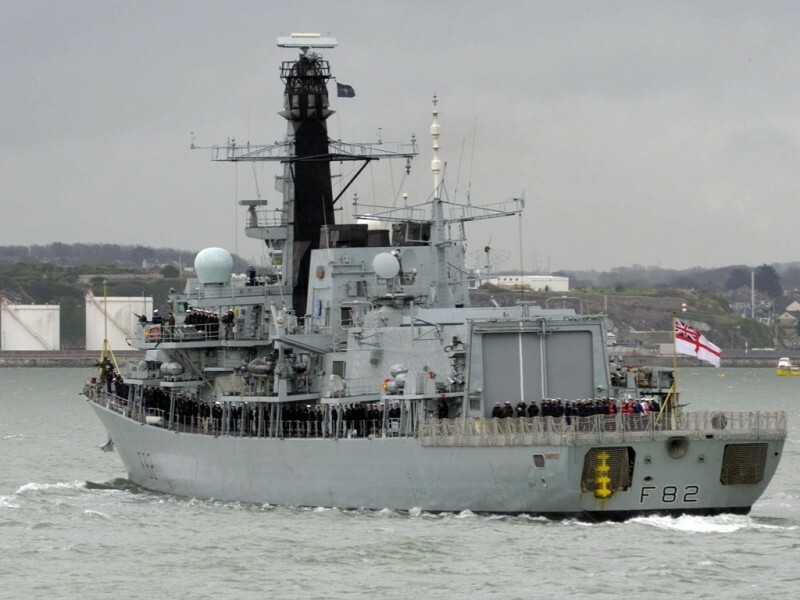 HMS Argyll will be going 'off-task' in the Gulf in the next few days time and handing over to HMS Campbeltown. 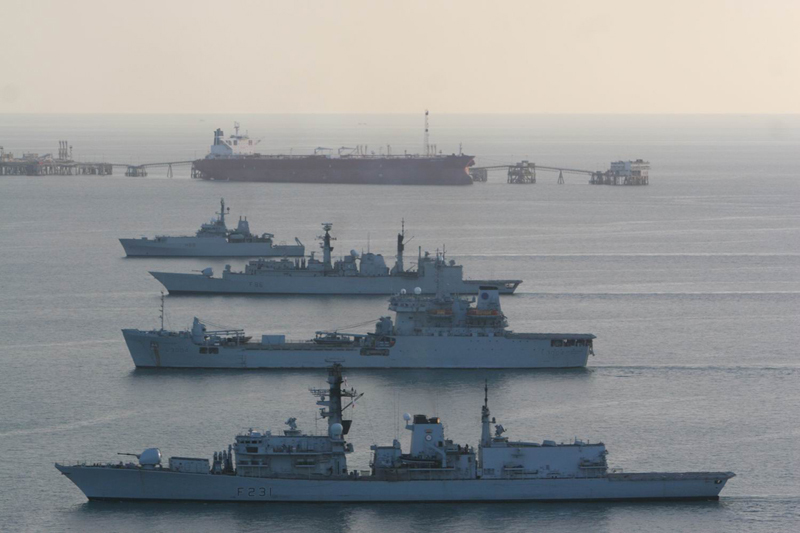 The ships are part of a significant Royal Navy presence, helping the Iraqis to maintain their maritime security and protect economically-vital oil terminals. 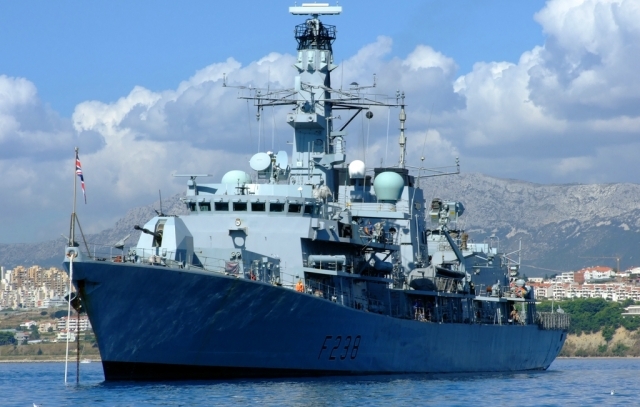 Plymouth-based HMS Somerset has sailed for a six-month maritime security patrol in the Mediterranean. The ship’s company will operate with a multinational force as part of the ongoing NATO mission to combat illegal use of international waters. 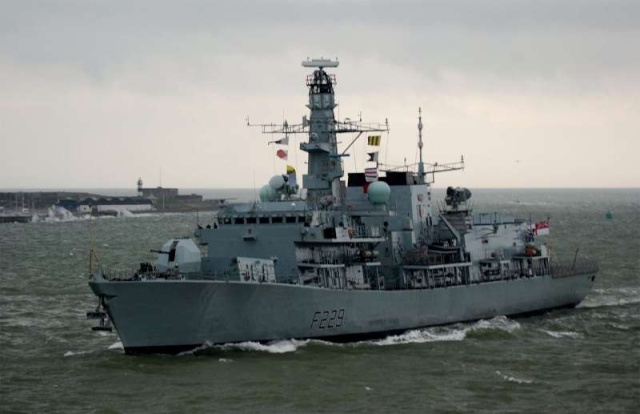 HMS Somerset left her homeport of Devonport to patrol the Mediterranean including join the standing NATO force conducting Operation Active Endeavour. The force will police shipping and board selected vessels. The ships of the multi-national force also gather intelligence on merchant shipping movements to detect suspicious activity. The force underlines NATO’s commitment to combating illegal use of the sea and conduct joint exercises to improve working and understanding between different navies. The NATO operation in the Mediterranean has been happening since October 2001 and has been bolstered by non-NATO nations such as the Ukraine, Georgia or Albania. In December, HMS Somerset completed a strenuous eight-week training regime with flying colours with the staff of Devonport-based Flag Officer Sea Training organisation to ensure the crew and the ship are honed to perfection to work in unison on whatever frontline task is demanded of them. 95% of the UK’s trade is moved by sea. Every day countless ships load and unload their cargoes at British ports. They are the lifeblood of the UK economy so it is vital for the nation’s prosperity the sea-lanes remain safe. The Mediterranean sea is a key shipping route both for merchant shipping from local nations and also for the bulk cargo ships going further afield through the Suez canal. However, the Mediterranean is also increasingly open to abuse from illegal activities such as people trafficking, smuggling and terrorism. HMS Somerset has recently undergone a multi-million pound refit and is one of the most modern and capable warships in the Fleet. Her recent deployments have provided maritime security off Iraq and in the Mediterranean. Her team of 180 dedicated sailors has ensured that she remains a potent element of Britain’s defence capability, acting as a force for good around the world.